Every city and town all over the world has its underbelly. It needn’t be an organised crime kind of underbelly as in The Mob, but it is an organised something. Usually covert. Usually subversive. This was put in the mailbox of everyone in my street today. 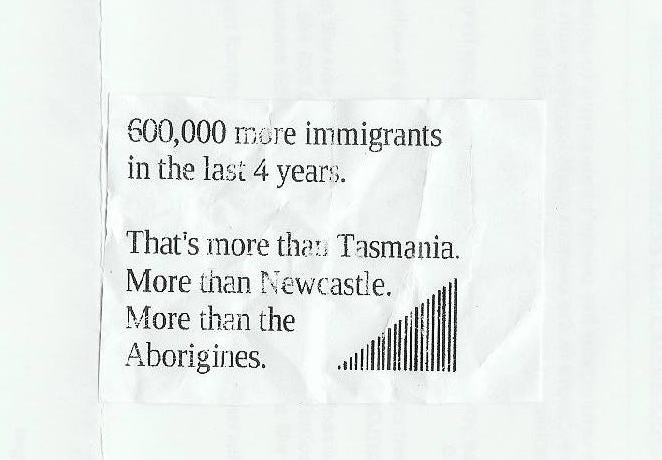 There are a lot of people in Australia for whom immigration is a real issue. Every now and then when I want to either be amused or infuriated I tune in to the radio shock jocks. There is nothing scarier than an Aussie redneck with a beer in one hand and a microphone in the other. They hate the Chinese, the Indians, people from the Middle East whom they refer to collectively as Muslims even if they’re from Israel, Africans, Eastern Europeans, the Indonesians – the list goes on and on. This kind of hatespeak is offensive, of course, and it should be easily dismissed. The problem is that oftentimes, it isn’t. It gets sucked into the underbelly and leaches, often quite subtly, into the mindsets of some parts of the community. Pretty much everyone in Australia came from somewhere else. Even our indigenous people came from southeast Asia originally. You will find that is the case for most nations across the world. So it’s probably fair to say that we’re all immigrants. When you ask people why they are opposed to immigration the usual response is they take our jobs. Or they immediately go on benefits so we end up supporting them. Or they create ghettos that are hotbeds for terrorism and anti-Australian sentiment. Let’s be realistic for a moment. There is one and only one reason to stop immigration. And that is if a country runs out of resources (and I include in that category water and affordable housing). What these fanatical groups don’t realise is how incredibly difficult it is to emigrate to Australia in the first place. The prerequisites are very tight. My sister Shelley was toying with moving back to Australia until recently. She lived here for over ten years and was an Australian citizen, but she gave up her citizenship for a U.S. Green Card. Even though she lived here before and has family here she would have to go through the same process as everyone else. People seeking entry to Australia have to go through a points system. For a permanent residency permit/visa there is an annual quota. If your circumstances allow you X number of points you can enter. If they do not, you cannot. You need professional work qualifications – which vary from year to year according to supply and demand. The big issue for most people though is transferable capital. Most people need a large chunk of savings as well as a guaranteed job before they are even considered for residency. My sister gave up – there was far too much red tape. There have been reports here and there in the local papers of the rise of Neo-Nazi groups in the inner city suburbs of Sydney. That worries me a lot. What is the function of a Neo-Nazi group apart from spreading hatred? To bash everyone who doesn’t look like a member of the Aryan nation? That person’s family could have lived here for three or four generations. That person could run a company or business that keeps hundreds of the people the Nazis define as real Aussies employed. That person could have been born here. I am a blonde-haired, blue-eyed, white skinned person. Yet I am an immigrant. Technically, I should be bashed too. I don’t understand why people who feel so strongly about what is essentially a political issue don’t lobby government. I am constantly writing letters to my local member about environmental issues. And because I write to her in a sensible, genuine way, she responds. I have spoken to her on the phone. Believe it or not it is possible to establish a working relationship with a politician as long as you don’t come across like a lunatic. So why don’t the Neo-Nazi, white supremacist groups lobby government? Because they prefer to get the veins of hatred throbbing. Spread a lot of misinformation and most importantly find a group to blame for the ills of society and you’re on to a winner. But mostly, because they’re there in the first place to keep the underbelly well fed. LOLZ. Although these days there seems to be an abundance of Aussie actors. I think they’re pinching the jobs of actors overseas. They’d better watch out or they’ll have some kind of subversive group after them…. Of course, if you go back to basics, ANYONE who isn’t an Aborigine is an ‘immigrant’. Re actors: I never could understand why Meryl Streep got the lead role in ‘A Cry in the Dark’ … esp. with that phoney accent and bad wig. Linda Chamberlain (? )(played Harold’s hippy daughter in ‘Neighbours’) was a natural for the part. Neo-Nazi groups and the like will never be legitimate, because their purpose, their raison d’etre, is not legitimate. As you pointed out, they survive on words like hate, fear and intimidation. My father moved to South Wales back in the late 60s, and was one of the first Indian doctors there. He helped other Indian doctors find work there, and things were good. Then, a local doctor made a comment during a medical council meeting that there were to0 many foreign doctors in the valley, and that steps should be taken to reduce their numbers. What surprised me was that the number of doctors who rejected that statement was predominantly non Indian! It gives you hope to see that amongst all this hate and discrimination, there are good people too. People who will stand up against injustice, and reject hatred in all of its forms. Personally, I think that a lack of education leads to hatred. People will always fear what they don’t understand, and a lot of these so called leaders prey upon people’s fears to further their own agenda. They can’t lobby because they have no case and, in most ,cases can’t form a grammatically correct sentence. Its worrying isn’t it? I’ve been in Sydney only for two years and it amazes me that people are actually surprised when I tell them that I still want to go back to India once I’m done with my studies. Why? Because to be completely honest, I dont want to live in a place where there are people who treat me like I’m any less than them. Its hard to understand being on this side of the nasty remarks like, ‘how dare you ask me for id? show me your passport’ or ‘what are you laughing at( i was laughing at something completely different)? bloody indians’. I really could go on and on. To be fair, I have met way more pleasant and kind people than the nasty ones. But the percentage isn’t as low as it should be for communal harmony (I am not saying India is any better, we have the same problems when it comes to religion or politics). I came here with my yes-i-am-a-citizen-of-this-world ideologies which i dont have as much faith in any more and that upsets me, is all. It is so widespread. I got a racist (though they wouldn’t see it as such) group email from the president of the school’s P&C (thankfully no longer there) about how if Australians and the English etc., don’t have enough kids than the country will explode with Muslims. That our ‘culture’ will disappear in about 20 years as a result. Total garbage being passed on as fact. Laughable if it wasn’t so serious. I love the part where you say even original Aussies come from somewhere else. It’s my sister’s favorite saying to recite: Australia began as a penal colony. So maybe these hate mongers…..come from good, solid stock! How disturbing to receive something like that! Here in the Middle East, racism is endemic and it’s sometimes shocking to see how the locals treat workers from India and Bangladesh, who are all here doing the jobs locals wouldn’t demean themselves to do in the first place. Love the new look blog BTW – very upmarket. And thanks for the listing! It’s wonderful to be appreciated. Im sorry but this sentence made me laugh, “There is nothing scarier than an Aussie redneck with a beer in one hand and a microphone in the other.” I can ONLY imagine! Now, in all seriousness, there are many crazed ‘anti-immigration nut bags’ in the good old USA too. And what I don’t get is they complain about the immigrants STEALING OUR JOBS, yet I don’t see any of those very same Americans longing, begging for, or demanding the KIND of jobs they are complaining about being stolen! It does seem particularly strange in Australia where everyone is a relatively recent immigrant. In times when the economy is bad and people are worried about their own futures, they turn on the easy targets, don’t they? People of a different colour are easy to pick out. When I was in Freo, and I met a new person, the first thing they said to me, was “I come from . . .” even if it was their grandparent rather than themselves. I”m sure they only said that because I was foreign but I rather liked it – the feeling that everyone was from somewhre else. But Western Australia is very white and clean and conservative and any underbelly in Perth was very well hidden. The only trouble I saw was grief given to the small groups of Aborgines who hung out by Coles in Freo drinking beer. The Far Right are very definitely getting a footing (politically) here in the UK and it is very scary to see. I don’t know know anything about immigration in Australia. Interesting. Australia and the US are both melting pots. I had no idea that it was an issue there – I never would have guessed. I’m finding it most curious that feelings are raging over similar issues globally. Selma, you write with great intellect. I’ve cut and pasted from one of my earlier posts that aligns with what you have talked about in this post. Apologies it is a bit long. “I cannot understand seeing another human being as some sort of enemy or threat. True, there are terrible people in the world and throughout history who have done atrocities and there is no love for them. Thanks to these types we must be on our guard all the time and a little suspicious of everyone. Terrorists do pose a threat and so do the assortment of not always to be trusted people who walk and live amongst us including politicians, church leaders and investment bankers, to name a few. Country of birth or nationality has nothing to do with whether or not a person will be a contributing, law abiding and trustworthy citizen of society. This might shock you to know, but I have never watched ‘Neighbours’ so I don’t know who the actress you are referring to is. My cousins in the UK (who adore Neighbours) think I am mad because they know how much TV I watch and can’t believe I keep bypassing their favourite show. I am a huge fan of Meryl Streep but I don’t think she nailed the Australian accent in that movie. However, she did give my family hours and hours of fun with the phrase: ‘A dingo ate my baby’ said in an overly strong Aussie accent. We are easily amused like that! Oh, it’s definitely a lack of education. You’ve hit on an important point which is that there will always be those who will stand up and say: ‘Oh no, this isn’t right.’ I applaud those people. I just wish their voices were a little louder. So true. They know anyone sane would just laugh at them. And yeah, they’re usually not too bright. Awww. I am really sad to hear that. You have enough to worry about while you’re attending University just getting through the work without having to worry about that nonsense. It’s a terrible shame that you have experienced that. I hope that for the remainder of your studies you experience only positives. I really appreciate you stopping by and sharing your valuable point of view. That’s the problem, isn’t it? It IS serious. I always want to dismiss these things and chuck the leaflet in the bin, but for every 1000 people who do that there is one who doesn’t. I would have thought by now that we would have gotten past all this crap. Aren’t we supposed to be the most sophisticated version of the human race yet? It’s a worry. Oh absolutely. They’re all descended from vagabonds and cut throats. Top shelf pedigrees, those guys! I have heard that. A close friend of mine lived in the Middle East for many years and she said the same thing. When I come across that level of racism I find it quite upsetting. The worst I have ever seen was from my husband’s half brother who comes from Capetown in South Africa. I could not believe what came out of his mouth. He was staying with us and I actually told him to leave my house. It was horrible. Glad you like the new blog. Every now and then I have a little play around. You are more than welcome! It’s exactly the same with some of the Aussies. Seems like this is a world wide problem. Yikes! I have heard that about WA. Could be because it’s more recently settled than NSW, perhaps. I have been reading about the rise of the far right in England. Scary stuff. Now you want to make me read that book of yours. Hope it’s going well. It’s a great story. I think immigration is an issue the world over. Let’s hope we can get a handle on some of these fringe groups before they get too over the top. Very well said. I couldn’t agree more. I love how you throw investment bankers in with the people not to be trusted. I was watching the chairman of Goldman Sachs in the U.S. trying to deflect questions about the role the big banks have played in the economic crash on the news yesterday. What a slimy, snake in the grass. All that money and education and he still can’t answer a straight question. You write with great eloquence and passion. Bravo! As you know Sel I am also an immigrant in that I was born in England to English parents but I have always and always will consider myself to be an Aussie. I have lived here for 46 of my nearly 50 years and I have Australian citizenship. I don’t agree with anyone who tries to get their point across using violence. Have all the wars in the world not taught these people anything? I just wanted to tell you a little story that amused me in the face of all this hatred. I was at a shopping centre once and a man who looked to be an Indian accidentally cut in line. The “Aussie” he cut in front of started with the name calling and “bloody Indians, why don’t you go back to your own country” etc etc. The “Indian” man waited for the tirade to finish and said in the broadest Aussie accent you’ve ever heard…”but I already am in my country”. The Aussie guys face was priceless. PS Just because I am so hepful, the name of the actress who played Kerry Bishop in Neighbours is Linda Hartley-Clark. Isn’t that funny. I wonder why we don’t. That is a great story. Serves the Aussie guy right. I completely agree with you – violence is not the answer to anything. Thanks for the Neighbours info. I really wouldn’t have known. As a brown man, I can understand why suddenly Australia, which for so many recent years, was the ‘ideal’ place for a lot of young Indians to migrate has suddenly come under so much negative focus. These racists (who should be tagged along with child molesters, rapists, murderers, terrorists, spousal abusers, people who hit older people, women or children) should be treated with utter contempt and wiped out. I don’t know why it’s suddenly happened but it’s in the news all the time. A young Indian student got bashed the other day. I am really ashamed because I think it is clouding the global view of Australia and Australians. It’s despicable.